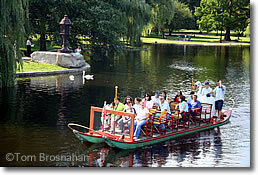 If Boston Common is the people's park, the Public Garden is Boston's more formal flower garden. Enjoy its classic natural beauty, but please keep off the grass. In colonial times the land west of Boston Common was salt marsh, but when the Back Bay was filled in during the 19th century, architect George Meacham was hired (1860) to turn this 24-acre (10-hectare) plot into a formal French-style public garden. Meandering through its center is a 4-acre (1.6-hectare) lagoon crossed by a small suspension bridge (1867). Pedal-powered swan boats have been giving locals and visitors, children and adults, slow, serene figure-eight cruises around the lagoon and its small island since 1877. At the ends of the suspension bridge are formal flower beds that blaze with tulips in spring, and are bright with color well into autumn. Though you can sit or stretch out on the grass of Boston Common as you like, regulations prohibit walking or sitting on the lawns of the Public Garden. Use the benches and walks instead. North of the Washington statue, the Ether Monument (1866) commemorates the first successful demonstration of general anesthesia (1846) at Massachusetts General Hospital. This milestone in medical science was hailed as the "greatest gift ever made to suffering humanity," putting an end to centuries of pain suffered during medical surgery. The statue at the southwestern corner of the Public Garden (corner of Arlington and Boylston streets) is of Transcendentalist William Ellery Channing (1780-1842), anti-slavery speaker and Unitarian minister of the Arlington Street Church across the street. On the east side of the garden by the Charles Street gate, is a statue of Boston writer and philanthropist Edward Everett Hale, author of The Man Without a Country. On the north side of the suspension bridge, near the east side of the lagoon, a row of ducks sculpted in bronze celebrates Make Way for Ducklings, the children's classic story (1941) by Robert McCloskey of a family of ducks who journey from the Public Garden to the Charles River Esplanade and the city that stops to let them pass. On the western side of the Public Garden, park-like Commonwealth Avenue carries Frederick Law Olmsted's inspired concept of an Emerald Necklace of green space westward.